Scythe shows off the Kaze Master Flat (KM06-BK), a new fan controller that will sell for 28EUR (excl. VAT). Japanese cooling expert Scythe expands the product portfolio of fan controllers by a brand new model. 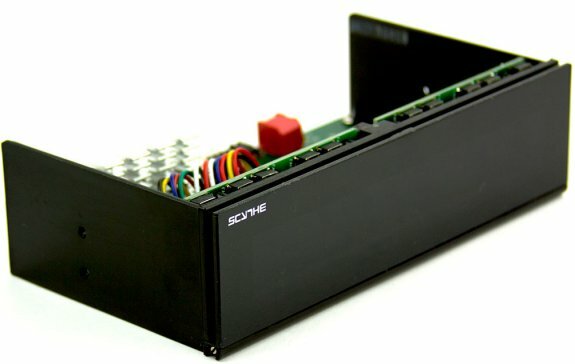 Scythe chose a different path when designing the new Kaze Master Flat fan controller. Previously announced fan controller models utilized rotating knobs (potentiometer) as control system. Kaze Master Flat comes with a front panel, which is covering the buttons used for operating the fan controller. Kaze Master Flat combines both a tidy and clean front panel design with Scythe's usual variety of functions. Hence allows it to match almost every on market PC Chassis. With only one finger tip users are able to open the front panel, which grants access to six buttons used as control system. Four of the buttons are being used to adjust the fan speed of the individual fan channel. The other two located on the both sided of Kaze Master Flat allow shutting down of the alarm signal and activating or deactivating of the built-in VF-Display (Vacuum Fluorescent Display). 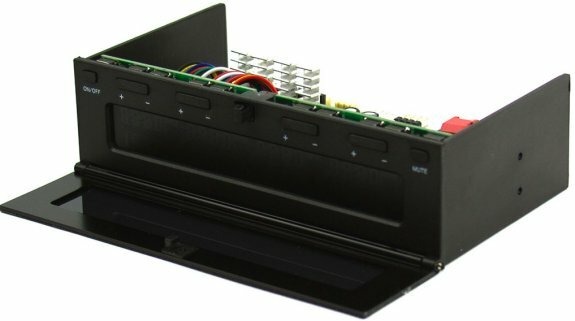 Kaze Master Flat fan controller fits common 5,25 inch pc case bays and allows users to control up to 4 fans individually as well as monitoring of 4 temperature sensors. Actual fan speed and temperature values of the 4 channels are displayed on the VF-Display (Vacuum Fluorescent Display) located in the front. Temperature values can be displayed both in degrees Celsius or degrees Fahrenheit. Supported temperature range is specified between 0 and 100°C respectively 32 and 199,9°F. Voltage regulation range for the four fan channels has been kept wide, supporting a stable voltage from 3,7 to 12 volts. Hence allows more room for fan speed and airflow optimizations inside the PC Chassis. Further new technological improvements have been applied to the safety features. Kaze Master Flat fan controller gives users the option to set an individual alarm temperature in 5°C steps by using the DIP-Switch located on the rear side of the fan controller. It is possible to set the alarm temperature in 5°C or 41°F steps from 55 to 90°C respectively from 131 to 194°F. Reaching of the set temperature would result in a visual and audio alarm by the Kaze Master Flat fan controller. The audio alarm can be shut down by pressing the mute button or permanently deactivated using the appropriate jumper. All the relevant information in regards to the built-in safety mechanisms, can be found in the supplied multilingual user manual.